NORMAN, Okla. — A Muslim man from Oklahoma who beheaded his coworker three years ago and attempted to decapitate a second woman has been found guilty of first-degree murder as a jury rejected his attorney’s insanity defense on Friday. Alton Nolen, 33, was also found guilty of four counts of assault with a dangerous weapon and one count of assault and battery with a deadly weapon. He faces sentencing beginning on Monday. Jurors only took two hours to deliberate the verdict after hearing testimony over a course of three weeks. 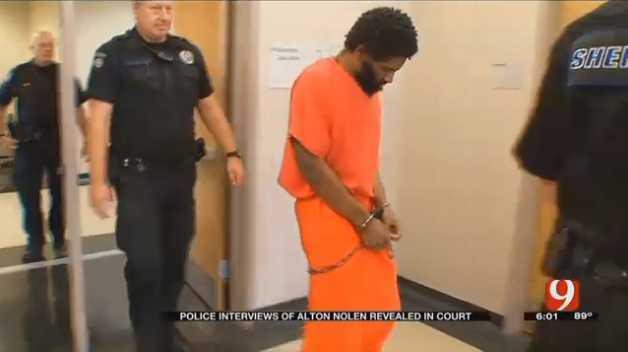 According to reports, some psychiatrists had testified that Nolen was mentally ill, while others stated that he acted with full knowledge that his behavior was wrong. Courthouse News reports that Dr. Antoinette McGarrahan told the court that she believed Nolen had “numerous indications of mental illness” as he would say “in the name of Allah” in odd placements during her examination, and remarked that he was feeling tempted by her exposed feet. He also called her an infidel. As previously reported, recorded audio of police questioning of Nolen was played for jurors last week. Nolen had stated numerous times that he wanted to enter a guilty plea, but his request was rejected. He also acknowledged his willingness to accept the death penalty. Nolen was hospitalized and was interviewed by police while in the hospital.